Didn’t fool you one bit, did I? 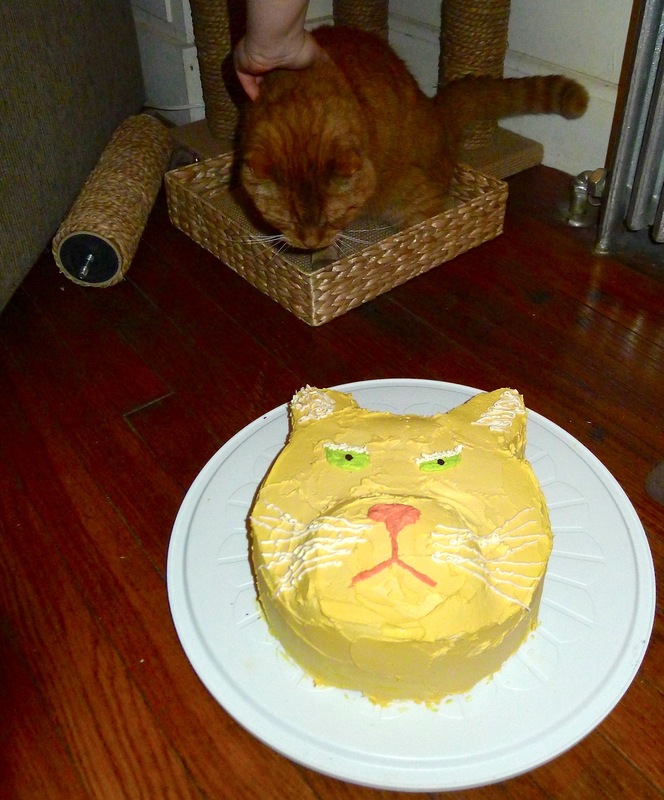 Trying to rapidly decorate a cat cake less than an hour before a potluck shouldn’t seem like a good idea. Ever. I’m not sure why I thought that would work out, but let me tell you: it was crazy! So, Dennis the Cat Cake looks a bit rugged because I was running around the kitchen frantically mixing colors, hastily putting them in ziplock bags, and hurriedly pushing frosting around with a toothpick, all while watching the clock tick down and debating the merits between being punctual and bringing a pretty cake. Punctuality won, as you can see. Dennis is the sweetest “old man” cat that my friends recently adopted… who also kind of looks like he could be in the mafia. To celebrate and introduce him to everyone, they invited us all over for a potluck party. There were some seriously incredible dishes to enjoy: garlic knots, “ants on a log,” warm bread and brie, potato latkes, spring rolls with a spicy sauce, noodles, asian coleslaw, wine… I could barely move by the end of it all! And all this before we even touched the cake. UGH. Luckily this cake was delicious, so it was worth the uncomfortable stomach fullness. But goodness, it was quite the meal. I had to keep this recipe relatively simple since I’ve never made a shaped cake before and didn’t have any directions to go off of, so I stuck to basics: one of the best chocolate cake recipes ever + a gooey salted caramel layer + buttercream frosting = simple and delicious! 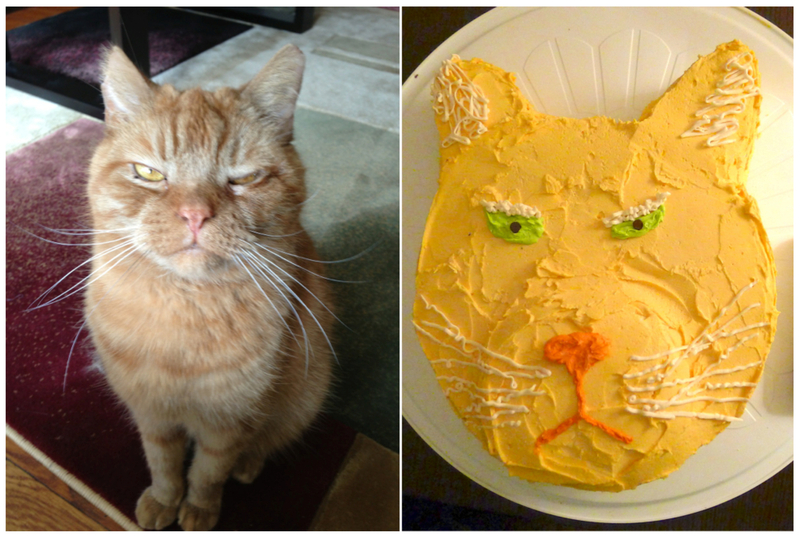 Definitely worth trying, even if you just make it a normal layer cake and don’t shape it into a cat’s face. 3. Bake for 30-35 minutes, or until a toothpick inserted in the center comes out almost clean. Let cool in the pans for about 20 minutes. Invert onto wire racks, carefully peel off the paper liners, and let cool completely. Like Deb notes, these cakes are incredibly delicate. Put them in the freezer for half an hour to make your life infinitely easier. In fact, it’s going to be essentially impossible for you to make a layer cake (let alone a cat face) out of these cakes if you don’t firm them up in the freezer. They’ll defrost once assembled, don’t worry. In a small saucepan over medium-low heat, mix the brown sugar, half-and-half, butter, and salt. Cook while whisking gently for 5-7 minutes, until it gets thicker (mine started bubbling and turned lightly golden at this point). Add the vanilla and cook one minute more to thicken further. Turn off the heat and remove from the stove. Set aside for use when assembling the cake. In the bowl of a stand mixer, beat together half of the sugar and all of the butter. Start on low speed until well-blended and then gradually add in more sugar. Increase speed to medium and beat for another 3 minutes. Add vanilla and cream and continue to beat on medium speed for 1 minute more, adding more cream or powdered sugar as necessary to reach spreading consistency. Gel food coloring should be beat or stirred in as desired (see directions below for details). 1. Remove the three cakes from the freezer. If they are not flat on top, level off the unevenness using a serrated knife. Place one cake down on your cake plate. Using the buttercream frosting, make a 1/2-inch tall and at least 1/2-inch wide “dam” all the way around the perimeter of this bottom cake. The dam will hold in your caramel, so make sure it’s tall and wide enough to prevent caramel from oozing out. 2. When you are confident in your dam’s ability to hold back the caramel, give your caramel a few stirs (at this point it should be a bit cool – don’t use it right off the stove or you’ll melt the buttercream frosting) and then gently pour it into the reservoir you’ve created in the center of your cake. *Note: if you are making a 3-layer cake (and not a cat face), only pour half the caramel in. Reserve the second half for the next layer, repeating this step. * Gently place a second cake circle on top of the buttercream and caramel. 3. Place the third cake on a flat surface, like a cutting board. From one of the edges, cut out a circle-ish shape for the mouth/nose area (use the edge of the cake as one of the “sides” of this shape, then line up this edge with the edge of your stacked cakes). Attach to the top of your stacked cake with buttercream frosting. From the remainder of the third cake, cut out four ears of the same size and attach them to the cake with buttercream frosting, stacking them two layers high so they are as tall as the cake. 4. Place the assembled cake in the refrigerator for 5-10 minutes, then remove and do a crumb coat. If you haven’t done one of these before, it’s basically a very thin layer of frosting that covers the entire cake and seals in crumbs. This way, when you frost “for real,” you don’t end up with cake bits mixing into your frosting and making it look ugly. Refrigerate for another 5-10 minutes to harden the crumb coat. 5. While your crumb coat is setting up in the refrigerator, tint your frosting with the gel food coloring. Think about how many colors you want and how much you need of each color, then mix up colors in different bowls. For this cake, I made a tiny bowl of pink and a tiny bowl of green, and saved a small bowl of white. I colored the rest of the frosting orange. When you’re ready to frost, remove your cake from the refrigerator and have at it! Frost with an offset spatula and decorate with piping bags. Small plastic bags with the tips cut off make for good piping bags if you don’t have any fancy ones. Toothpicks are very helpful for pushing frosting around to make small details. Finish off with chocolate chips for eyes (I used mini ones). And of course, an inside shot. See that caramel oozing out everywhere? Oh, my! 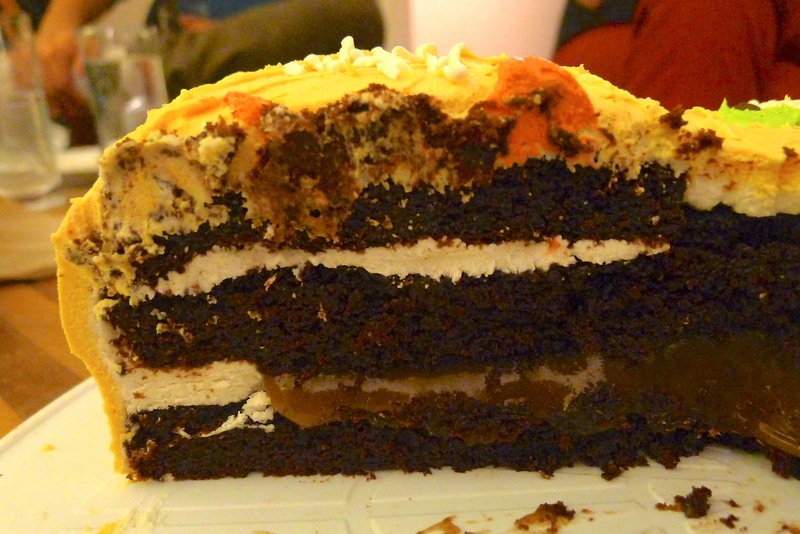 And note the buttercream strip at the edge of the caramel – that’s the “dam” I talked about, holding all the caramel in. This isn’t a pretty cake by any means, but I promise you that no one will care about aesthetics after one bite of this cake!